I agree 30-06, not sure if it is worth the work. I cannot speak from experience as I do not have the tools the swage my own rifle bullets but have fooled around with swaging some pistol bullets a few times with a little CH4D set I have. I look forward to hearing how your tip experiment goes, 30-06 and good luck turkey hunting. I think I am sitting this season out again as all our turkey are on the dry side of the state and the cost of diesel is a little too high for me to drive over there a few times. 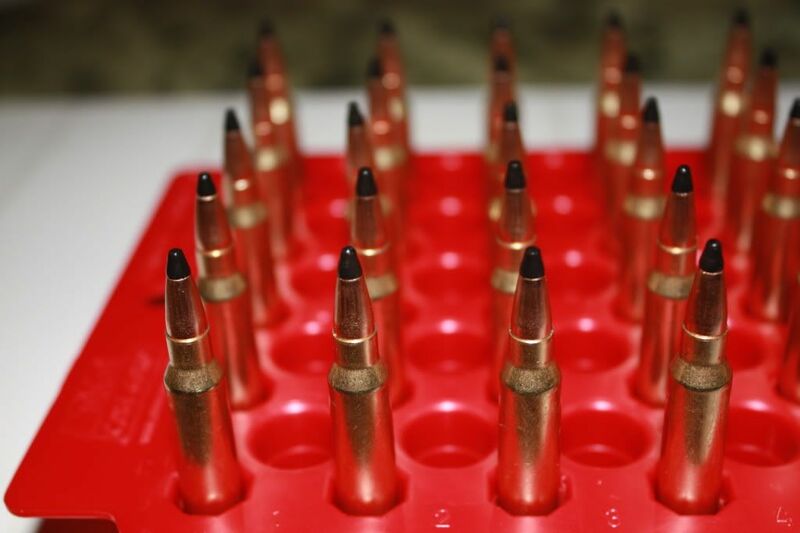 I have shot thousands of the Nosler and Hornady bullets. I have compared them to the cheaper soft point and hollow point bullets like the Dogtown bullets that Midway sells, and see very little difference. On paper, the standard deviation difference between the soft point, hollow point and BT bullets is so slight as to be statistically indifferent. On the critter, the difference is a little more telling. While the hollow point and soft point bullets lack the explosive expansion of the BT bullets, they do expand well enough to kill all manner of vermin. If I am shooting marmot, or other larger-bodied pest like rock chuck, the hollow point or BT bullet is not my choice but rather a soft point to get a little deeper penetration of the critter. I have had some BT bullets explode on the hide of the larger critters and while it makes a hellacious wound, it is not immediately fatal - I hate to see any critter suffer even if it is a pest. I have had some home-rolled .22 LR cased soft point bullets that a friend gave me and their performance was on par with any of the commercial soft point varmint bullets. I like the explosive expansion of the Nosler and Hornady bullets. They are immediatly fatal on the prairie rats. If someone could figure how to make them at home for cheaper - that would be neat but for me I think I will continue to purchase the commercial bullets. I suppose it comes down which is more important to you - your time or your money? For me I have less time at the bench than I do money, so I will buy the commerical bullets. I look forward to seeing how some of these home rolled attempts turn out, and hope that you can keep the cost low. well i found a place that I can buy the tips for about 17.00 a thousand. so ballistic tips will cost me about 13 cents apiece to make. if they shoot as good as i am hoping they will though a major pain to make they could be worth it. You CAN do it, we have faith! Course this is coming from a guy that gave up on making ballistic tipped bullets because he was missing a punch that was most needed. Well that is about 4 cents less than I pay from Midway buying the 50 gr Nosler BT in the 1,000 round bulk box, not counting S&H. I wonder if you could use recycled .22 LR hulls as a jacket and that might reduce your cost a bit 30-06? I haunt all the online auction sites looking for bulk lots of BT bullets. Sometimes I find some factory blemished or pulled bullets. Hard to find BT bullets though much cheaper than that even if you pony up the $ for the huge 5,000 count boxes. Its the S&H that eats up any savings buying the huge bulk lots. My UPS guy grumbles about the weight. Of course the UPS guy is still mad at me for the 75 lbs of linotype he just delivered the other day. well im making 62gr my rifle does not like light bullets the minimum it will even think of shooting true. so back to why no rimfire Jackets they arent long enough to make a 62 grain you need space left over thats why the berger .800 jacket. I shoot a T/C Encore in .22-250 AI and .22 Cheetah Mk 1 with 1-14 twist and they really like the 40 gr Varmit Grenades and the 50 gr BT. Have you considered trying spent .22 WMR or .17 HMR brass to use as a jacket? Over on THR, there were a few guys fooling around with the longer .22 WMR and .17 HMR to make 6mm bullets in the 80 gr range. I have seen 17 HMR all over the ground at the range too. Since no one has been using them we have been dumping them in the recycling bin. I envy you that you can turn your own neck expanding punch. Would make since as there are lots of the 17 HMR brass out there. I would have to wait for ever for CH4D to turn me a neck expander plug. I have been waiting almost 5 months for my bullet sizing die, but at least they are busy and not going under. I have a .240 Weatherby (the only Weatherby I now own or will own again) with a 28" Shilen barrel. It screams those little 6mm pills near about as fast as you can push them. I look forward 30-06 to seeing how your bullets compare to the commercial fodder. Reload3006 wrote: well im making 62gr my rifle does not like light bullets the minimum it will even think of shooting true. so back to why no rimfire Jackets they arent long enough to make a 62 grain you need space left over thats why the berger .800 jacket. On THR the guys were using the Stinger cases as well as trimming .22 WMR cases to length with a case trimmer. OK sorry folks i didn't have a camera. 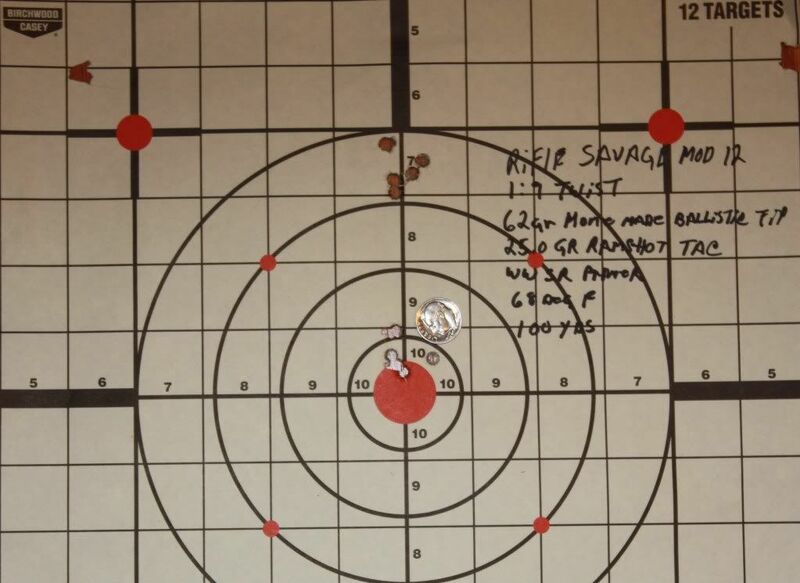 Got the savage model 12 .223 out today and tested my ballistic tips .... shot a 5 shot group .750+/- and I think its probably more me than the rifle or bullets. I need to build a good stable shooting bench. I was using my patio table and its kind of wobbly. Also my rest left a lot to be desired. So if it was a prairie rat or ground hog no doubt dead as a tack hammer. I looked but to be honest not very good behind the target for a bullet didnt see much sign of anything I'm thinking they pretty much denigrated. 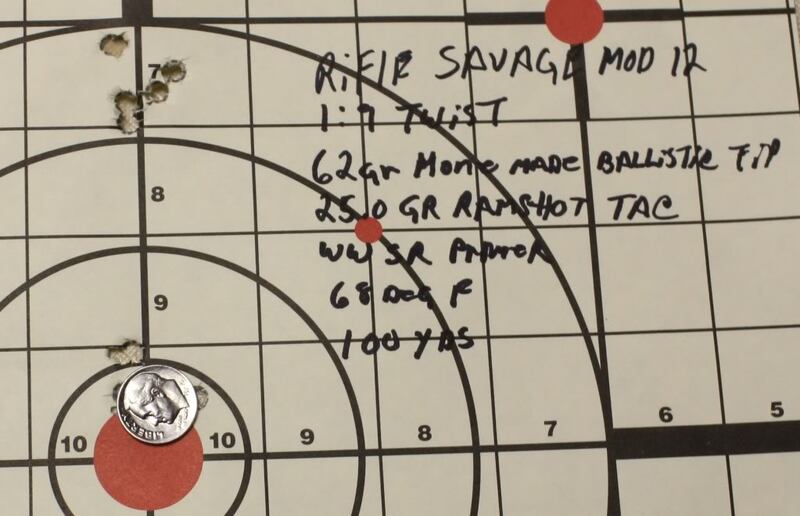 62gr home swage ballistic tip. If the monsoon stops will see how they fly and take pics this time. Well I couldn't do any turkey hunting so I tested out the Ballistic Tips. I must say I am very pleased. Check it out. Impressive Reload! You did a great job on those ballistic tips! after reading through all of these posts.... WOW I was not expecting groupings like that..... very well done.... what were your ballistic tips finally made out of??? Looking good! Excellent groups for home made bullets....very impressed. Those were made with ski plugs. and thanks I think I can maybe make those groups a little better that was with new FL sized brass. I am going to try the same thing with Neck Sized and see if i can squeeze it down just a little more. Those are mighty fine looking. So a rubber nose? they are a mailable plastic. I tested some of these out. I loaded them with 25.5gr of Varget and seated them to a OAL of 2.335" . Since they are almost exactly 1.0" long, I didn't want the extra .10" taking up valuable case capacity over what my 69gr SMK's do at a length of .900". They will not fit in a AR15 magazine, but they loaded and cycled fine in my Savage 12fv. 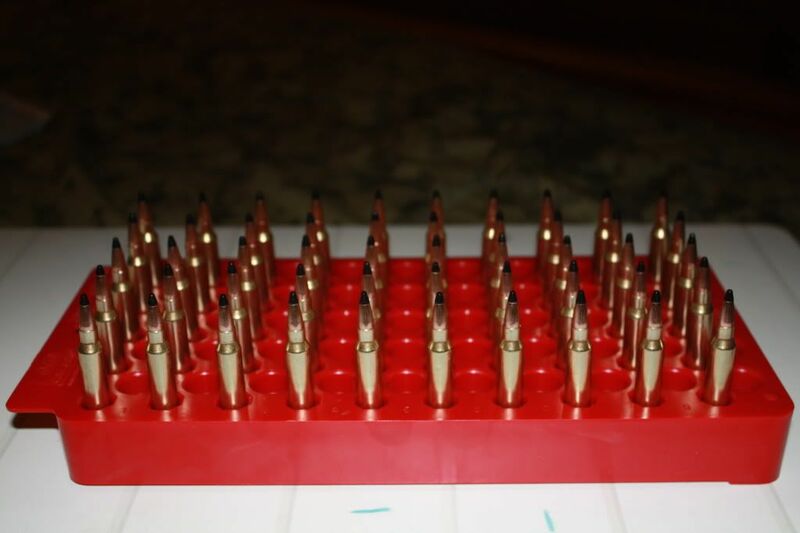 I also used FL sized brass and shot averaged group sizes of 1/2" when I do my part. Not bad at all for home swaged bullets...that according to Reload3006, are more for hunting than precision target shooting. They shoot just as well as my 69gr SMK's do so that is impressive in my book. I'm saving the rest for the yotes.